Sea scallops (sometimes seen as divers’ scallops) are expensive but delicious. This recipe is a quick and easy way to serve seared scallops for a light luncheon or a simple fish course. Lightly season the scallops on both sides with salt and pepper. Trim the lettuce leaves to remove the center rib, cutting each leaf in half from end to end. Heat the oil in a heavy skillet until very hot, over medium-high heat. It should be nearly at the smoke point, about 400°F (200°C). Arrange scallops in the hot oil and fry 2 to 2½ minutes, until a golden brown. Then turn and sear the other side. Place half a Romaine leaf on a clean surface and spoon a small amount (maybe half a teaspoon) of salad dressing down the center. (This is where a good homemade salad dressing, rich in herbs, will flavor the dish well.) 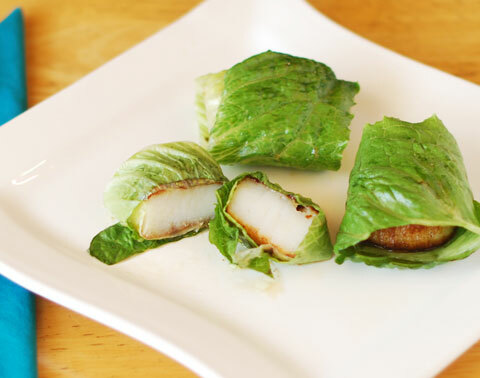 Arrange a seared scallop (it should be hot from the pan) on the leaf, toward the white stem end, and roll toward the green end, encasing the scallop in the leaf. Continue until all the scallops are rolled. Plate and serve immediately. For a light side dish you could include sliced tomatoes dressed with extra virgin olive oil, salt, and pepper, or make a rice pilaf or soup. *The scallops often sold in the fish case at the grocery store are typically “wet-pack” scallops. They are treated with a sodium tripolyphosphate solution that gives them a longer shelf life. The solution makes the scallops hold more liquid (which makes them weigh more so that they sell for more). When you try to sear them the liquid oozes out and, at best, you can only steam them. “Dry-pack” scallops are not treated. They sear more easily. Reliable fish stores usually sell fresh dry-pack scallops, but they are expensive. Quick-frozen scallops will often suffice, thawed, because they are frozen soon after harvest, therefore not needing the sodium tripolyphosphate treatment.